I always get asked what supplements I use, what I workout with, what books I read, etc. 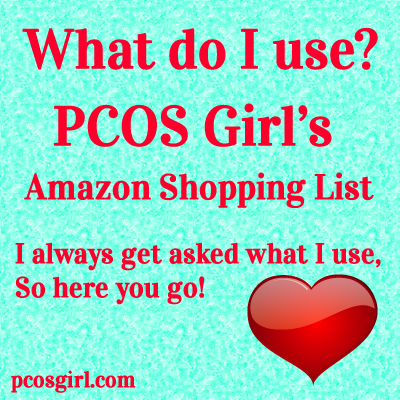 So I decided to list all the PCOS stuff I personally use- I’m not sponsored or paid by any of these companies- BUT I do link them through Amazon’s Affiliate program. I figured if I was listing them then why not try to make some cents in the process- lol! I cycle through supplements, since I don’t like taking handfuls everyday. Currently I’m taking a Prenatal, Mega Magnesium- which I bought at Sprouts (it’s not available on Amazon), Alpha Lipoic Acid, Probiotic and Inositol. My current supplement schedule is: 2 Alpha Lipoic Acid caps in the AM before breakfast, Probiotic after breakfast, 2-3 Mega Magnesium caps at lunch, Prenatal with dinner, and 3 Inositol caps at bedtime. This is MY schedule- check with your doctor about dosage, etc. In a few weeks I plan to modify my Inositol to 2 caps in the AM and 2 at bedtime. Yes, we are trying to get pregnant again! I use an app on phone to input data about my cycle and then use Ovulation sticks to see if I’m actually ovulating. I had bloodwork and HSG performed and I’m on a prenatal and Inositol to help push ovulation. I also tried the Soy Isoflavones to push ovulation. There are two over the counter hormone helpers I call them. Progesterone which is used by MANY women to help with their symptoms as well as Soy Isoflavones to aid in fertility and hormone balance. Read the reviews and talk with your doctor. I will add more items here as I use them and have good results. If there’s something I’m missing- just let me know via the comments! This entry was posted in Coping with PCOS, PCOS, PCOS Symptoms & Meds, PCOS Weight Control. Thanks for the info,what is the best way and supplement to lose lose weight with POc and Insulin resistant?? For me- it was dieting (no carbs, no processed sugar) and Iodine plus a handful of other supplements. Have you tried Saw palmetto or Thyme oil for hormonal balance? I got pregnant doing low carb twice. Now that I’m finished breastfeeding I would like to try supplements, but not sure what to try. I’m thinking about cinnamon, saw palmetto, magnesium and thyme oil. What app do you use to track your ovulation? What iodine would you recommend? Totally depends on you. I would suggest starting off with a small dose and working your way up. Keep and journal and track any changes you see happening. I started off using the cheapest 🙂 just to save money. Does having aloevera pulp on empty stomach is helpful?? I missed my period for a month i have symptoms like hair thinning, pimples, oily ski n so i started having aloe vera pulp on empty stomach every morning is this helps in balancing hormones..